Fly to the ruff-ruff rescue with the all-new PAW Patrol Air Patroller! Now you can fly to the aid of Adventure Bay in 2 unique ways. With rotating propellers, the Air Patroller easily transforms from a helicopter into a plane! And for added adventure, the Air Patroller has real lights and sounds that accompany you on all your Air Rescue missions. Earn your wings by loading up the entire PAW Patrol team in the Cargo Bay and Cockpit. You can fit up to 2 characters in the Cockpit and 4 in the Cargo Bay. When you’re ready to save the day, the included Robo Dog figure will help pilot the Air Patroller for a successful rescue mission. 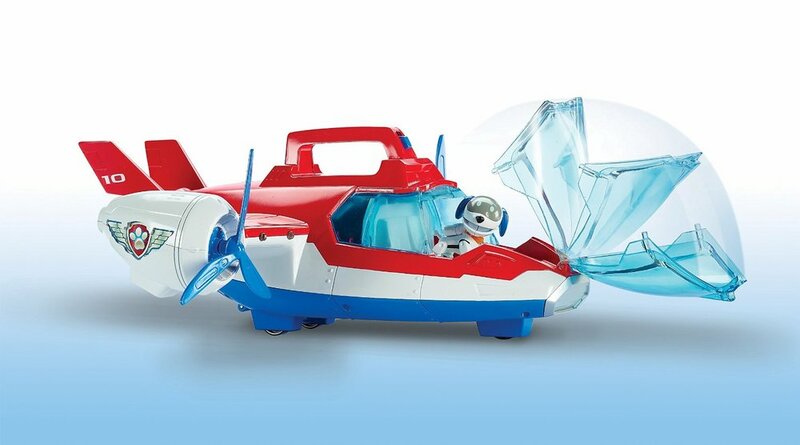 When the mission is complete, you can bring the Air Patroller in for a landing with its real working wheels or transform to helicopter mode and hover down for a perfect pooch landing atop the Paw Patroller (sold separately). Bring home the air rescue adventures of Adventure Bay with the PAW Patrol Air Patroller! Well, Paw Patrol is a household favourite here, so anything with these little pups on will go down well. This beauty is strong and robust and perfect for my little tornado of terror. The sounds aren't as annoying as many of the other noises toys and the lights aren't as in your face and bright. It is easy to play with and perfect for little fingers. It comes 'ready to play' with batteries already inserted so any Christmas/Birthday morning will be less frantic. Robo-Dog is included and really cute, however you can swap and change the characters with the other pups (sold separately). It is quite chunky so it will have to have it's own shelf but it will look perfect in any child's room. The Air Patroller is for kids ages 3+. 3 x LR44 batteries required (included).